President Donald Trump shared on Twitter Wednesday a video of sharp words he directed toward NATO Secretary General Jens Stoltenberg about Germany being "totally controlled by Russia" regarding their energy relationship. "Germany, as far as I’m concerned, is captive to Russia because it’s getting so much of its energy from Russia," Trump told Stoltenberg at a bilateral breakfast ahead of the NATO summit in Brussels, Belgium. Seated alongside Secretary of State Mike Pompeo, NATO Permanent Representative Kay Bailey Hutchinson and Chief of Staff John Kelly, who looked uncomfortable as his boss spoke, Trump lit into Germany over the 800-mile pipeline it hopes to construct beneath the Baltic Sea, called Nord Stream 2. Washington and Eastern European countries oppose the pipeline, fearing it could cut them off from critical energy supplies and make Europe too reliant on Russian gas, the Washington Post reports. "Germany is totally controlled by Russia, because they were getting from 60 to 70 percent of their energy from Russia and a new pipeline, and you tell me if that's appropriate, because I think it's not, and I think it's a very bad thing for NATO, and I don't think it should have happened, and I think we have to talk to Germany about it," Trump said. Trump shared an extended clip of his remarks. Trump also attacked Germany for not meeting NATO defense spending obligations, a consistent theme of his presidency. The Washington Post reported Trump demanded credit from Stoltenberg for an uptick in NATO defense budgets, which began rising after Russia annexed Crimea in 2014 but has accelerated since Trump took office. "We're protecting Germany. We're protecting France. We're protecting everybody," he said. "And yet, we're paying a lot of money to protect … I think it's very unfair to our country." Trump called Germany a rich country that could increase its defense spending immediately if it wanted to. Merkel, who grew up in Communist-controlled East Germany, rejected the notion of being controlled by Russia in remarks to reporters. "I myself experienced that a part of Germany that was controlled by the Soviet Union, and I am very happy today that we are united in freedom as the Federal Republic of Germany," Merkel said. "We decide our own policies and make our own decisions." 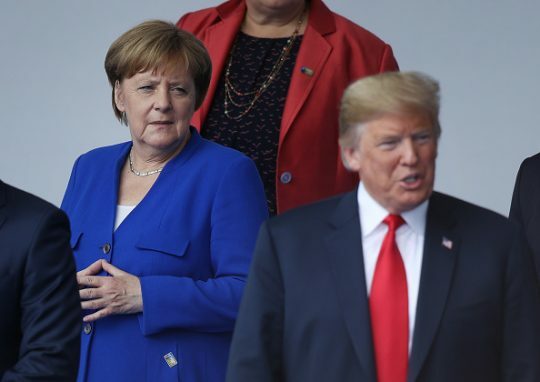 "Germany does a lot for NATO," she added. This entry was posted in National Security and tagged Angela Merkel, Germany, NATO, President Trump, Russia. Bookmark the permalink.